I'm still waiting on the final forms from my university before I buy my batteries, but I went ahead and purchased a new flywheel and clutch. 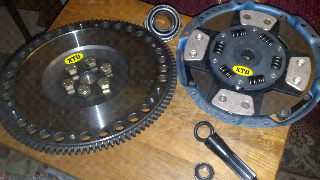 Its a stage 4 clutch that's good for 400 ft lb of torque so it should do nicely. I am also waiting on the final parts for my charger which should be in by the end of the week. I am gearing up for the conversion, which I hope to start within the next 3 weeks!